Unique attractiveness & fashionable flair to this stylish. Check this out! Black Pearls Double Stranded Necklace with rhinestones rings spacer on the second strand bright beautiful a perfect piece for anyone to wear for a formal or casual occasion. This necklace is a great gift to female friends & relatives. Choose her favorite color & we can customize special color for gift someone in special color. 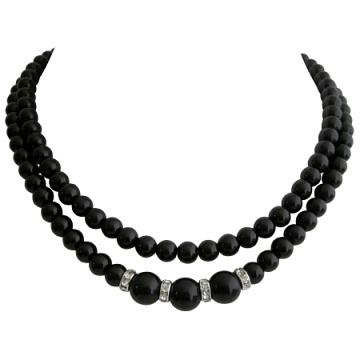 Buy Handmade Wedding Necklace Black Pearls Double Strand Necklace, sold & shipped by Fashion Jewelry For Everyone where you can shop online for Leading Online Retailer for Indian Fashion Jewelry. This Necklace Sets collection has been tagged as Andmade Necklace,Wedding Necklace,Necklace Pearls,Black Wedding,Black Necklace,Black Pearls,Pearls Necklace,Double Strand,Handmade,Wedding,Necklace,Black,Pearls,Double,Strand,Handmade Wedding Necklace,Pearl.